When I saw the Windows 8 Metro interface for the first time I was fascinated by the fluidity, motion, font and … the color palette. It was just different. In my bid to produce a Windows 8 Metro application I am approaching the color selection carefully and I have opted to use a fascinating tool I discovered recently, Adobe Kuler. 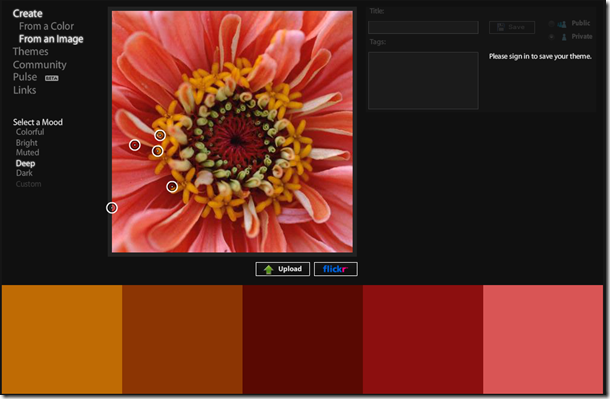 Adobe Kuler is a web based application designed to assist in creating and sharing color themes. There are literally thousands of color themes already created by the Kuler community, and you can quickly and easily create and integrate your own using the simple spoke selection tool shown below. You can also use the color extraction tool to produce themes from desktop images or from your own Flickr stream. Adobe Kuler has native applications for Windows and tablets, and if you are inclined, there is also an API that gives developers the ability to integrate and create new services using Kuler themes.